Why Should you Belong to the Sydenham Sportsmen’s Association? This is true. The Sydenham Sportsmen’s Association is not strictly for the purpose of planning hunting and fishing trips. In fact, you may find that you have less time to hunt and fish if you join. The reason for this is that the S S A is, in fact, a Conservation organization. 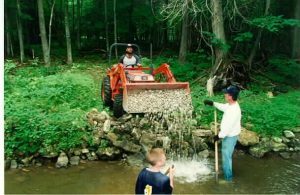 We are involved with many fisheries and wildlife projects which include projects like raising up to 500 000 salmonids each year, building and maintaining hundreds of Eastern Bluebird nesting boxes along with organizing and operating an extremely successful fishing derby at Owen Sound in Georgian Bay, the Owen Sound Salmon Spectacular, which is the funding sources for most of our many conservation projects etc. etc. These projects are sanctioned by local M N R staff and completed totally by volunteers. We invite you to be a part of this dedicated group of conservationists and help “make a difference”. If you care about the wise management of our wildlife resources, the future of hunting and fishing and are prepared to get involved and be active, you are likely a potential member of the Sydenham Sportsmen’s Association and we invite you to complete the membership application form located on this web site and mail it with your cheque to the address on the form. Monthly club meetings occur on the first Thursday of each month at 7:30 PM, excluding July and August and are held at the SSA Clubhouse, directly opposite Lincoln Park in Derby Township. Each prospective member is invited to attend as a guest and find out more about current initiatives and activities. Members receive a monthly newsletter, which provides current vital information, as well as a notice of meetings. In addition, numerous social activities occur: namely Beef Barbecue, Corn Roast etc. Among the many natural features of our area are the spectacular sunsets over Owen Sound’s harbour. This is also the setting for our annual Owen Sound Salmon Spectacular. For more images from our activities and endeavours check out our image gallery. The new Sporting Clays range is up and running after months of work, Planning and opening up areas. The course is a nice dry walk on level packed gravel. Most of the 13 stations are shaded, we are using 10 stations with three more open to change it up once in a while. Come on out, its a hoot to shoot! See more here……….